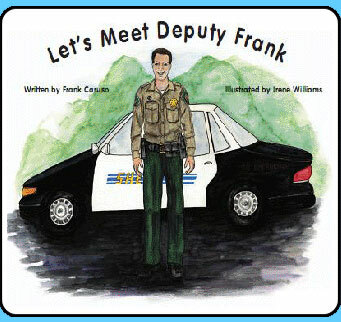 Let's Meet Officer Frank and Let's Meet Deputy Frank are childrens books designed to educate preschool through third-grade level children about their relationship with law enforcement. Detailed illustrations and easy-to-read text enable children to see a police officer and deputy in their on-duty and off-duty roles, emphasizing that police officers and deputies are real people, just like they are. Whether you are a teacher introducing your students to community servants, a parent teaching your children about police officers or deputies, a crime prevention specialist using these books as an officer friendly tool, an officer or deputy wanting to build better relations with your community, or someone wanting to give a valuable gift to a child, these books can provide a visually stimulating learning experience for children ages four to eight. Looking for a Supervised Child Visitation Monitor?